Indications: Calcium channel blocker prescribed to treat high blood pressure (hypertension), chest pain (angina) and other heart conditions as deemed appropriate. The drug is prescribed off-label. Summary Recommendations: Verapamil can effectively reduce high blood pressure with regular use. Patients should take the full dose, as prescribed, daily. Stopping this medication early or when you find out you're pregnant can lead to an unhealthy rise in blood pressure. Tell your doctor about all medical conditions, diagnoses, diseases and medications in your medical history. General Precautions: Verapamil should be used as prescribed for the treatment of hypertension. Patients with low blood pressure and those who've suffered a recent heart attack should not use this medication without informing the prescribing physician. Patients with liver disease, kidney disease, muscular dystrophy, myasthenia gravis or congestive heart failure need to discuss the benefits and risks of taking verapamil with their doctor. Patients should continue taking the medication even if they find out they're pregnant until a different treatment plan can be outlined and adopted. Verapamil is known to interact with other medications, so patients need to report all current and recent medications and any changes in medications while on the drug. Verapamil can cause loss of alertness, so driving or operating machinery while taking the medication may be out of the question. Effects While Trying to Conceive: The maximum dose of verapamil approved by the Food and Drug Administration has not been shown to affect fertility in any way. 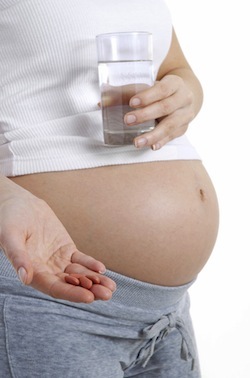 Effects on Pregnancy: Verapamil is currently used to treat hypertension during pregnancy. The drug does pass through the placenta to the fetus, but there have been no reports of fetal complications or birth defects as a result of taking verapamil. Information collected by the Michigan Medicaid Birth Defects Study showed no negative side effects or contraindications for use during pregnancy. Hypotension can be a side effect of using the intravenous form of the drug in a clinical setting. When hospitalized, blood pressure readings will be monitored closely. Hypotension can cause reduced blood flow to the uterus and potentially affect the health of the fetus. Verapamil will pass to baby in milk, but the concentration is estimated at less than 0.1% of the maternal dose. Those the level of the drug in milk is constant and steady, the amount delivered to the infant is so low that blood pressure is not affected, according to case studies.